Immediate Product Allocation & Expected Product Allocation(Allocation Types) Field in Logistics Areas. The system provides you with predefined logistics area types that you can use to model logistics areas according to their business use, for example, production area, receiving area, shipping area, and storage area. For example, you can model the structure of your warehouse by defining a logistics area for each aisle, rack, or bin. 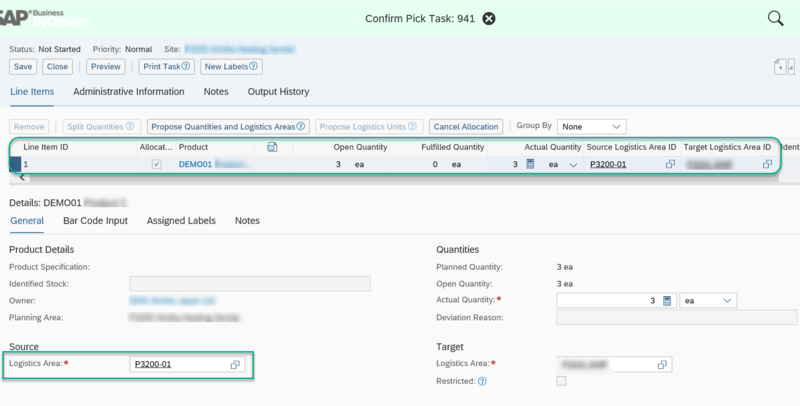 Different storage control parameters allow you to set up the rules governing the way products are stored in a logistics area. By setting up these rules, you can store and move products efficiently within warehouses. Allocation takes place during the warehouse processing of any logistics process. In an outbound process for example, which starts from an outbound delivery, the allocation will only take place once the system tries to find a logistics area for picking. In a task-based scenario, the system will allocate the goods as soon as the logistics area is proposed in the task. 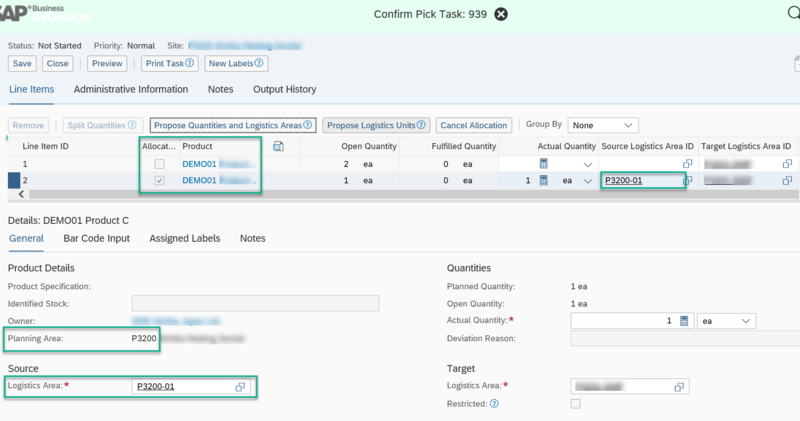 Using the allocation type you can define whether you want to allocate the on-hand stock or expected stock. If this field is left empty, there is no reservation for the specific logistics area. Allocation Type settings are valid for all products in the logistics area. Define the Type of Stock Allocation for the Logistics Area. If this field is left empty, there is no reservation for the specific logistics area. Allocation Type settings are valid for all products in the logistics area. The Allocation Type settings only show if the Inventory-Managed check box is checked for the logistics area. The allocation concept is independent of the negative stock settings. There are following types of availability. Available Inventory based on the existing Inventory levels. Available inventory, based on the existing Inventory levels and takes into account expected outgoing inventory changes. Available inventory, based on the existing inventory levels and takes into account expected outgoing inventory changes and expected incoming stock. Immediate Product Allocation works on On-Hand Availability whereas the Expected Product Allocation works on Expected Availability. Immediate Product Allocation means that you can only allocate the actual on-hand stock. If you use Immediate Product Allocation, it is recommended that you do not configure the logistics area to allow negative stock. This ensures that allocated stock is in fact physically present in the logistics area. The allocation concept is independent of the negative stock settings. Expected Product Allocation means that you can additionally allocate the stock which will be brought to the specific logistics area. Allocation takes place during the warehouse processing of any logistics process. In an outbound process for example, which starts from an outbound delivery, the allocation will only take place once the system tries to find a logistics area for picking. In a task-based scenario, the system will allocate the goods as soon as the logistics area is proposed in the task. Expected Incoming Stock can be created via Replenishment, Removal and other Inbound Scenario on the Put Away LOA like STO, Customer Return, Purchase Inbound etc. Expected Incoming Stock is created and calculated on the Logistics Area level and not based on Transaction / Receipt Documents like Inbound Delivery Notification. In this case Logistics Area has to marked as Negative Stock Allowed. This is important in case of Expected Allocation because the Expected Incoming will always be greater than the On-Hand and might lead to negative stock at the time of Save. Define whether you want to allocate on-hand stock or expected stock by choosing the corresponding allocation type from the Allocation Type list. Let us understand Allocation types with a simple example illustrated below. Logistics Area P3200-01 Allocation type is set as Immediate Product Allocation. 2)Product DEMO01 has 1 quantity On-Hand Stock and Incoming quantity(thru replenishment task) as 17 ea for Logistics Area P3200-01. 3) While confirming the Pick task for the same product which had 1 ea. as On-hand stock the below behavior is seen, System splits the line item and 1 ea. is available for confirmation as seen in the second line item. 1)Now, Logistics Area P3200-01 Allocation type is set as Expected Product Allocation. 2) As per screenshot-2 Stock On-hand is 1 ea. , inbound quantity is 17ea i.e. 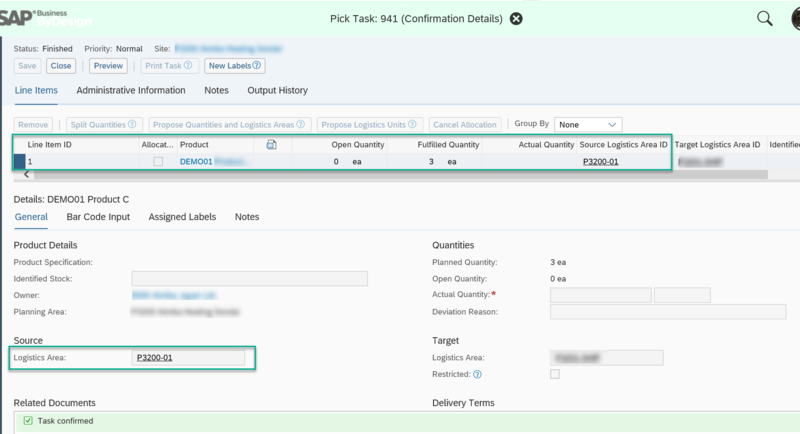 expected receipts, when you try to confirm the task with Allocation type as “Expected Product allocation” System confirms the task for complete requested quantity 3 ea. You see the below behavior. 3) Task is confirmed successfully with 3 ea. although 1 ea. is available On-hand.